Looking at the numbers this weekend, you wouldn't expect that we've seen higher total dollars roll through the box office four of the last five weeks. Three films amassed more than $20MM this weekend, and six total films managed $10MM+. But scrolling down the list we can see that things drop off quickly - this may be the first post I've seen where a film in the Top 15 didn't even make $500K. Nonetheless, "Evil Dead" and "Jurassic Park 3D" were both very strong in their debuts, and last week's "G.I. Joe: Retaliation" kept up with the crowd as well. Hit the jump for a full breakdown on this week's total numbers, including a few notes on the top grossing films! This weekend, as generally expected, it was the remake of Sam Raimi's horror classic, "Evil Dead", that leaped to the top of the charts. The film made $26MM this weekend, which even out-performed most projections. Tacking on the unexpected $4.5MM it made internationally, that brings its total first weekend gross up to just over $30MM. And with a budget of $17MM, it's already nearly doubled its investment. The film has received positive reviews overall, some mixed, and our own Ben Foutch gave this a composite 7/10. As Ben is the biggest Sam Raimi/Evil Dead/Horror Movie fan I know, this was a very encouraging and trusted score. I did not have time to check this out this weekend, but I will be making time sometime within the next week. As far as how this one stacks up to previous Horror Remakes, it actually lands in the #10 spot, behind a cornucopia of iconic titles. While we're all well aware of the horror remake infatuation these days, looking at that list, I'm just amazed to see exactly how many notable titles have received the remake treatment in just the last decade alone. It's astounding. Moving on to second place, and it was last weekend's big winner, "G.I. Joe: Retaliation", grabbing $21.1MM. That brings its domestic total up to $86.6MM in just ten days, and coupled with its massive $145MM international gains in the same time, that brings its worldwide gross up to $231MM. This is the sequel to 2009's "G.I. Joe: Rise of the Cobra", which ended up making more than $300MM worldwide. While it still managed half of that gross here in the States, critically, it was still considered a disaster, earning a 34% rating on Rotten Tomatoes. But the second edition had people hoping for something more. The thought was that the production team recognized their mistakes with the first installment and would be able to provide the G.I. Joe movie we all wanted this time around. And even after a release delay of more than six months (we just thought they were trying to cram more Channing Tatum into the film), we still hoped for the best. But when the dust settled, it was still a train wreck, with critics giving this installment a 28% review rating. This dissuaded me from seeing the film, but not general audiences. The film is on about the same track domestically as the first film, box office wise, but is out-performing on the international end, which should allow this one to surpass the $300MM mark with ease. So while it may feature a few different faces, expect to see another sub-par G.I. Joe movie in the next 2-4 years. In third place this weekend was "The Croods", which is now in its third weekend. The film managed $21MM, bringing its domestic gross all the way up to $125.8MM. Couple that with the $204MM it's made internationally and that results in a worldwide gross of just over $330MM. DreamWorks Animation has quickly compiled a respectable slate of films, and it finally feels like they have more to offer than just Shrek movies. I say that because even with $125MM on the domestic side of things, that still places "The Croods" in 17th place on DreamWorks' list of highest grossing movies. It still has a ways to go to catch any of the Madagascar movies or aforementioned Shrek films, but it seems likely that this one will eventually wind up in the top 10 on this list, at the very least. Fourth place saw our second "new" release this weekend, "Jurassic Park 3D". The film made $18.2MM this weekend, as well as another $3MM internationally. There will be no point in following totals from here on out, because they'll just tack them onto the previous gains this film made back with its original release. This was a strong debut for a live-action 3D re-release though, falling right in between what we saw from "Titanic" ($17MM) and "Star Wars: Episode 1 - The Phantom Menace" ($22MM) last year. 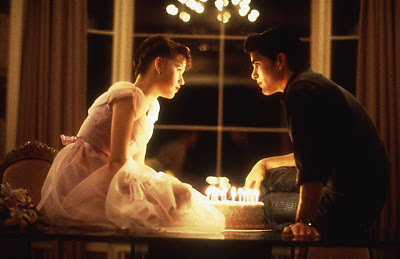 You all know of my love for this film, and as it's technically 20 years old itself, I can spare you most of the details. I hope to discuss the film on an upcoming CinemaCast, but briefly, I'll state that overall this was a wonderful experience. I never saw this film in theaters as a child, so this was my first chance to see it on the big screen with professional-quality visuals and sound. Some of the 3D was a little choppy, and unfortunately it did make the dinosaurs look a tad less real, but overall, it still looked pretty good. And luckily that score doesn't loose any of its power with the 3D conversion. Rounding out the top five this week was "Olympus Has Fallen". The film made $10MM in its third weekend, which was quite surprising to me. The film received very mixed reviews, but I recall stating in a previous edition of this post that sometimes a split decision on an action film is really all you need (I recall one critic quipping that this was the best Die Hard movie of the year; I found that to be an entertaining comment). With its $10MM this weekend, that now brings its total domestic gross up to just over $71MM, which is a cool $1MM more than its budget of $70MM. It's added a nice $5MM internationally for a worldwide gross of $76MM. While I've heard mostly favorable things from the movie from trusted sources, I did not expect that it would make its budget back in only three weeks. This has been a strong run by a film that, unlike so many we see today, had no built-in audience. I still have not seen this film, though I have wanted to since its first week (unfortunately, I'm guessing this will fall to a rental at this point). For some reason, I am glad to see the film doing well though. I hope it has enough in the tank to break the $100MM mark. By the way, the film is up to #6 on Box Office Mojo's list of President Movies, and will be in the Top 5 within one more day's gross. I don't know if it can climb much higher than that, but it should have a firm grip on that #5 spot at the very least. Outside of the Top 5 there isn't too much that stands out to me. 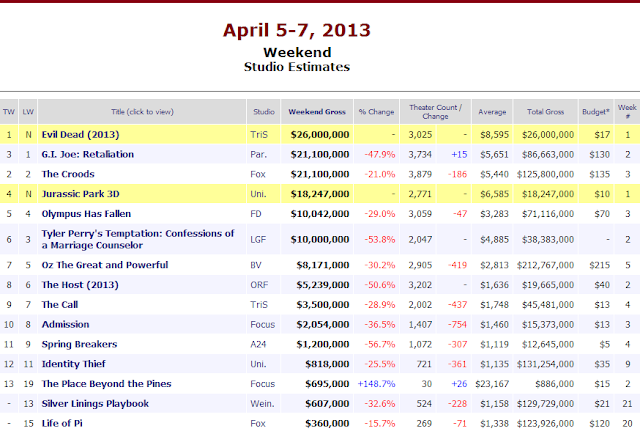 In five weeks now, "Oz the Great and Powerful" is now only $3MM away from matching its $215MM budget, which amazes me. And that's just on the domestic side - taking its worldwide gross into account ($454MM), its already more than doubled that number.